Pests which attack clothing and furnishings are known as textile pests. These pests attack natural fibres and not man-made products. Textile pests fall into two categories moths and beetles. Whilst these days most carpet manufacturers undertake to mothproof of carpets and therefore attack by moths has been greatly reduced. Where carpets have not been treated often in older houses the threat still exits and the damage caused can be quite extensive. Unfortunately, in addition, the level of attack by beetle has increased and this is mainly due to the installation of central heating and wall to wall carpeting in. many modern homes. Whilst there are numerous species of textile pests the most commonly known are the clothes moth, the varied carpet beetle and the fur beetle. The clothes moth known to most people as a textile pest and is becoming common to domestic properties. However, it is not the moth that does the damage, it is the larvae. 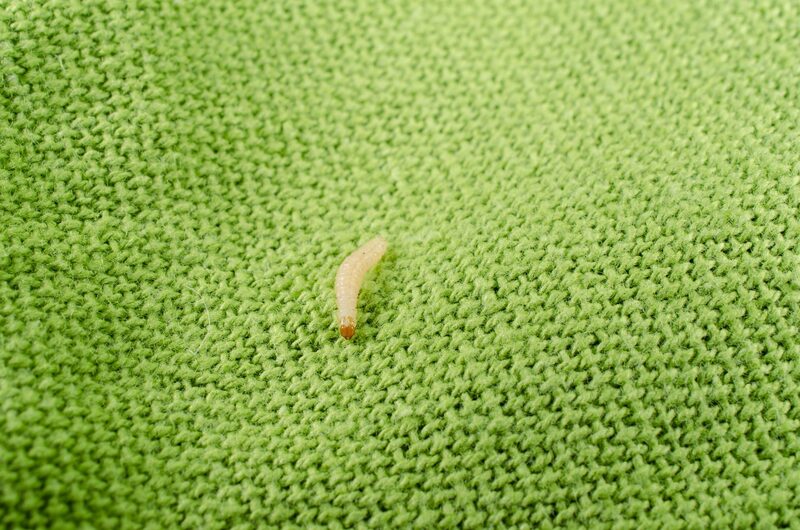 The larvae attack natural fibres not man-made fibres and often cause damage to areas which are not seen immediately, underneath furniture for instance. Moth infestations can prove particularly difficult to eliminate. The adult common clothes moth has a body length of between 6 mm and 8 mm and a wingspan of 9mm to 16mm. The upper side of the forewings is buff, nearly golden, in colour. Both pairs of wings have fringed margins. Adults are rarely seen in flight. The larvae are yellowish white in colour with a brown head and measures around 10 mm in length when fully mature. The adult female lays eggs, between 50 and 100, amongst the material upon which the larvae will feed. The larvae emerge from the egg and proceed to feed. Whilst feeding the larva of the clothes moth frequently constructs a loose silken “shelter” which has attached to it many particles of debris and faecal pellets etc. Once mature the larva pupates. The pupa is reddish brown in colour. There is a certain amount of mobility in the abdomen of the pupa and it will twitch if disturbed. The adult emerges from the pupal case. The adult moth lives for around 2 – 3 weeks. The clothes moth is a significant pest, the larvae feeding on a wide variety of material of animal origin such as woollens, furs, etc. Damage from larval feeding can be severe and the larvae are often difficult to detect since they shun the light. Whilst adults indoors can be found on the wing all year round. Outdoors, adults are on the wind from May to September. Treatment consists of tracing the source of infestation, removing and destroying any infested foodstuffs and then applying a residual insecticide to infested areas. Care should be taken to select a non-staining insecticide if soft furnishings are to be treated. Additionally, an ultra-low volume application of insecticide would prove effective. The use of monitoring traps specific for this species will aid in determining the level of infestation. Whilst there is no difficulty in controlling these moths, it is essential that a thorough treatment be carried out and that every possible larval development site is treated. They may be found in association with birds and mammals nests, therefore these possibilities should be checked when tracing the source of the infestation.